Hudson Yards on the west side of Manhattan is a work in progress and will be so for several years to come. Become acquainted with the area's construction sites, detours, and barriers, as they'll be here for awhile. 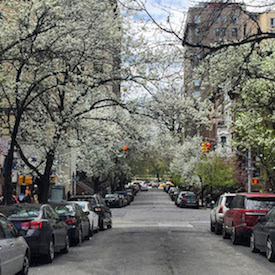 A visit to the north end of the High Line or to the new 7 train extension at 34th Street, discussed here, involves negotiating a landscape of high cranes and big digs. I was reminded of Ashcan School artist George Bellows's paintings of the excavations for the original Penn Station, that palace of transportation so famously torn down to make room for Madison Square Garden. I think he must have painted the pictures near this very spot. Anyway, we're in another chapter of that (west side) story. With the High Line, the conversion of rails to trails is part of a metamorphosis of a working manufacturing city into a recreational one. 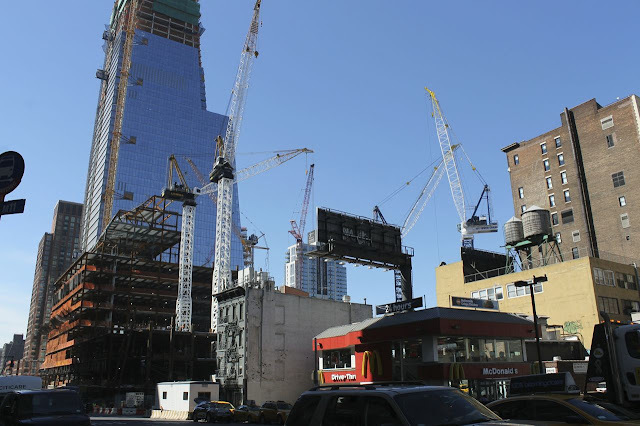 With Hudson Yards, the equivalent of a small city is taking shape over the rails. This area of the west side is a little unsettled. 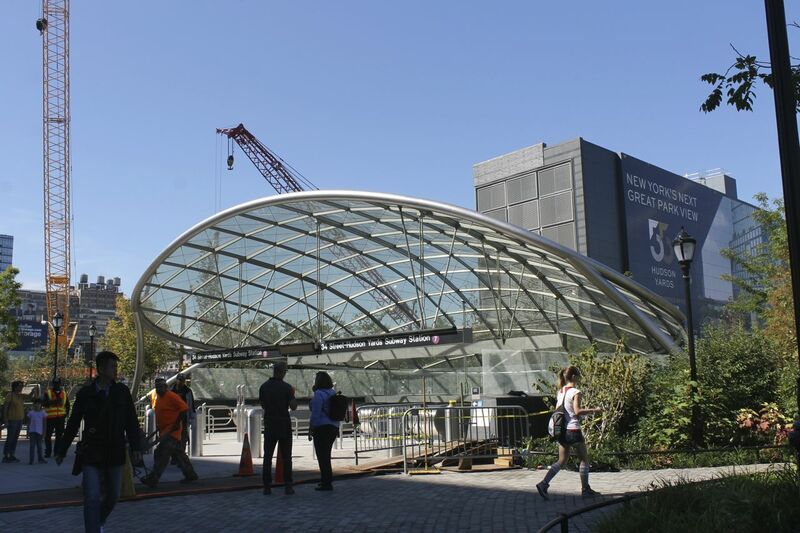 The new 34 Street-Hudson Yards Subway Station, the long-awaited extension of the 7 train, now provides easy access to this city in progress. 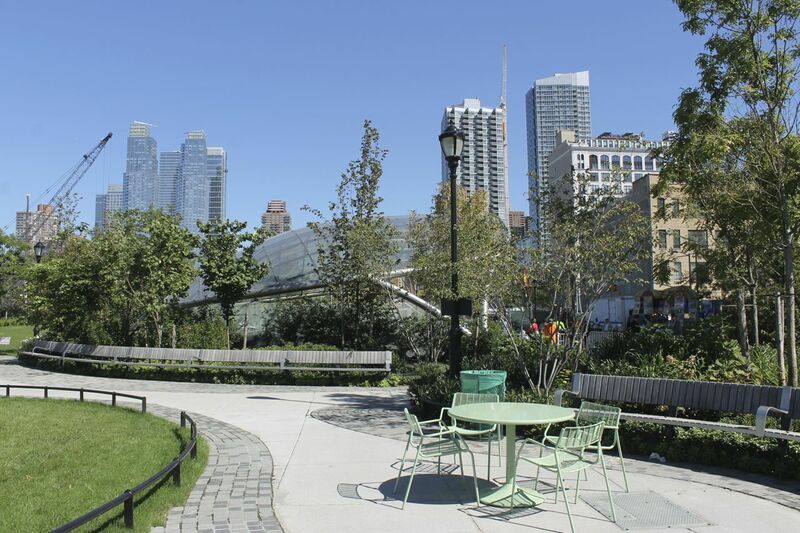 For now, the landscaped park at the station (above) offers a pleasant contrast to the bustle of unfinished buildings. The station itself is modern, sleek, and entertaining. The steep escalators, which according to the MTA are the highest and longest in the system, are a little dizzying. The station provides easy access to the northern stretch of The High Line and to the newly renovated Javits Center. Other nearby points of interest include the Megabus stop on W. 34th, Hell's Kitchen Flea Market (this post from July 2011 now takes on a documentary aspect), and Pier 66. The latter features both a busy riverfront restaurant and a quieter parallel pier (below). 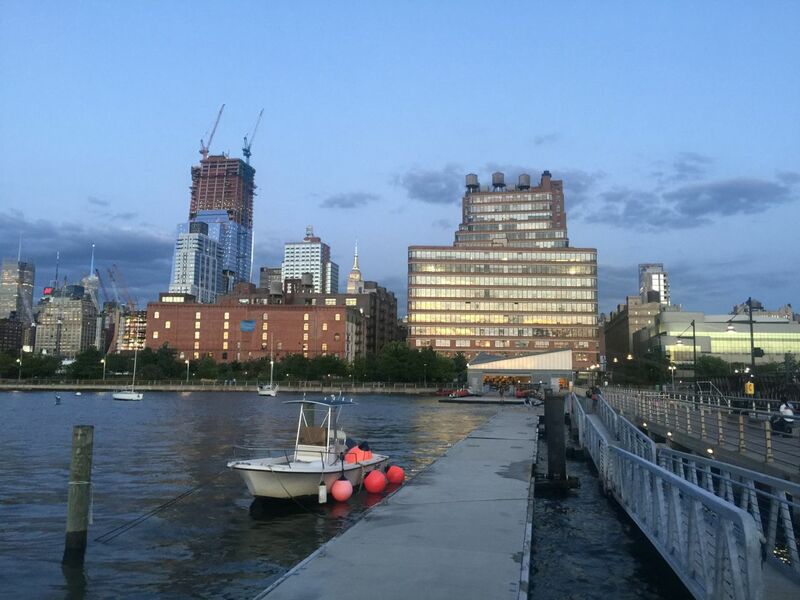 View of the Starrett-Lehigh Building, shimmering at sunset, from Pier 66. Home to the long-playing immersive theatre production, SLEEP NO MORE, the McKittrick Hotel (530 W. 27th St.) has expanded to include a rooftop bar and additional events. The enormous Starrett-Lehigh Building, a landmark of industrial architecture, houses elite fashion brands and the Martha Stewart Café. 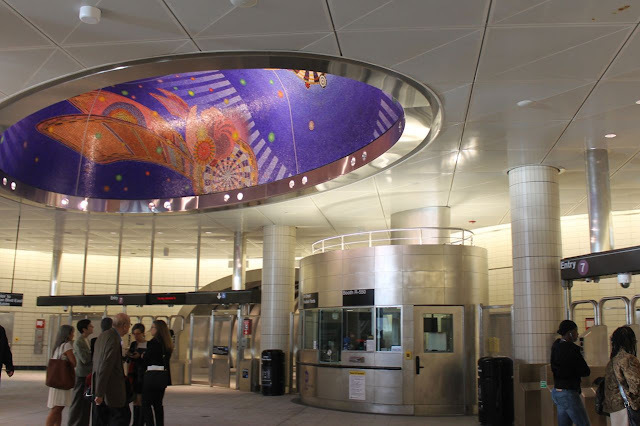 After boarding at the 34th Street-Hudson Yards station, the next train stops on the 7 line in Manhattan are Times Square, Bryant Park, and Grand Central Terminal. Now, that's convenient. 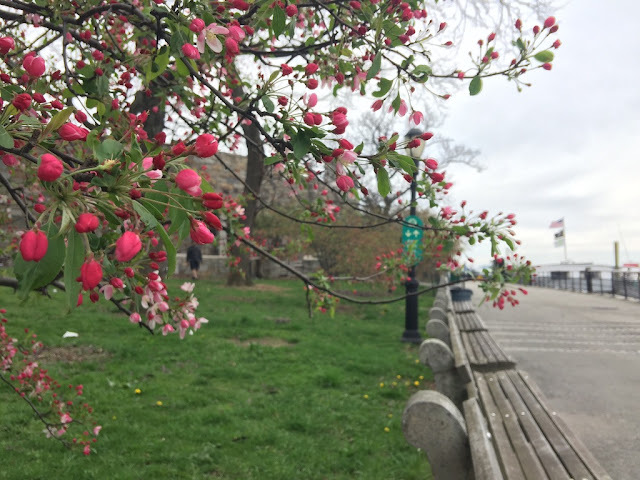 Images by Walking Off the Big Apple.